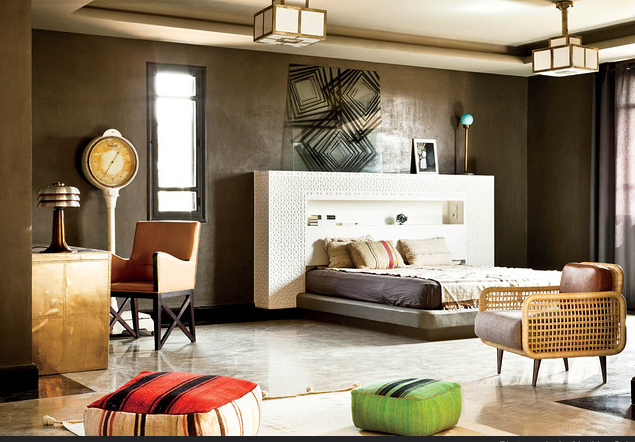 You can find inspiration for your pad anywhere, pottering thru city streets, taking a stroll in the park with the bow wows, flicking thru magazines, travel you name it you can be inspired. Today however I need to go further afield to be inspired as the weatherÂ in this country isÂ driving me nuts (the wettest June on record and we’re now in July and guess what it is still raining!Â Every night over supper I’m thinking relocation, relocation somewhere sunny so I can potter in the garden and keep bees. Simple things like that. 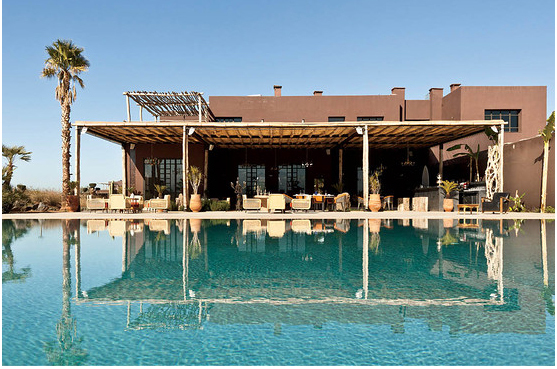 The space I am about to show you is pretty remarkable, The Fallah Hotel in Marrakech is owned by Redha Moali and his wife Houria Afoufou who turned farmland into aÂ 60-room hotel, cultural centre and library. 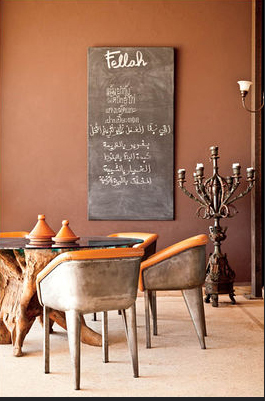 A Versailles trained landscape gardener turned the scrub of the desert into a kitchen garden and orchard, a chief brought in from France creates contemporary Moroccan cuisine.Â The hotel itself is a collection of mud coloured buildingsÂ and the interiors a collection of mid-century flea market finds and commissions from local artists, This place inspires in two ways firstly the interior and exterior of the space -Â beautiful palette, beautiful furnishings it exudes a feeling of laid back casualness. Secondly this couple had no experience before as either hoteliers or philanthropists, they followed their heart, took a gamble and its paid off. So today’s life lesson is follow your dreams (hard to do when its gloomy and raining) but we only get one shot might as well make it our best hey!